Please state your dietary requirements when you sign up. It is very early due to Easter. Tina Daniel is our April guest speaker. Tina will be telling a gripping tale about her ascent of Mt. 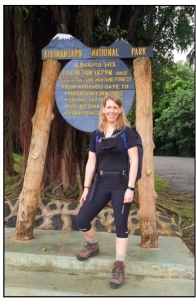 Kilimanjaro – Africa’s highest mountain, and the world’s highest freestanding mountain. The purpose of the climb was to collect funds for charity together with a team of 28 others. Tina is a young woman who trained and prepared for the walk for many months. Her trip was delayed four months due to an eye problem last summer, but finally in January she was able to travel, leaving her family in Denmark. Tina will talk about the trip, the hardships and disappointments all the way through to the thrill and excitement of facing such a challenge. As she came down she told her mother, Jean Gram-Andersen, “never again”. Let’s hear what Tina now feels after some months. There was tragedy on the mountain that we sincerely hope Tina has been able to overcome. She should be proud of her efforts and we look forward very much to her talk. 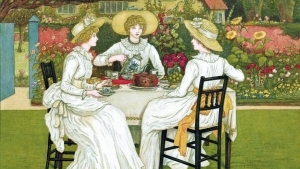 THE PHILANTHROPIC COMMITTEE is in the process of arranging a special Afternoon Tea in White. We will all have to appear in white outfits (accessories can be of another colour). The best outfit – by popular vote – will be rewarded with a prize. We will endeavour to have all sweets and cakes in white, too. And white tea of course! MORE INFOMATION WILL BE FOLLOW…!!!!! The 800th Anniversary of the “mystical manifestation” of the Danish flag, “Dannebrog”, coincides this year with the centenary of the Independence of the Estonian capital city. A wonderful opportunity to visit this Baltic neighbour state. This incl. 3 nights at the hotel with large breakfast buffet.